Episode 2 "Feathery Tape" from the Under The Mask series. Michael, Lukas, Shane and Anna have been busy putting together a new single that has led them back into White Hart Studios where they've begun trucking down a new road on their musical adventure. Sign up with your email address to receive news, updates, free music and more on what Michael and the Rotoscopers are up to next! Episode 1 "The First Pass" from the Under The Mask series. A first look at Michael Gresham & The Rotoscopers. A teaser for a short video documentary series we are starting called Under The Mask. Come back Tursday April.28th for Episode 1! Hailing from Victoria, BC, Michael Leigh Gresham has spent the last few years weaving together emotive vocals and sounds that make you feel removed from life’s stresses. Growing up, Gresham sought inspiration from Ben Harper, Matt Costa, Jack Johnson, The Beatles, Arcade Fire, Bahamas and Lovin Spoonful. 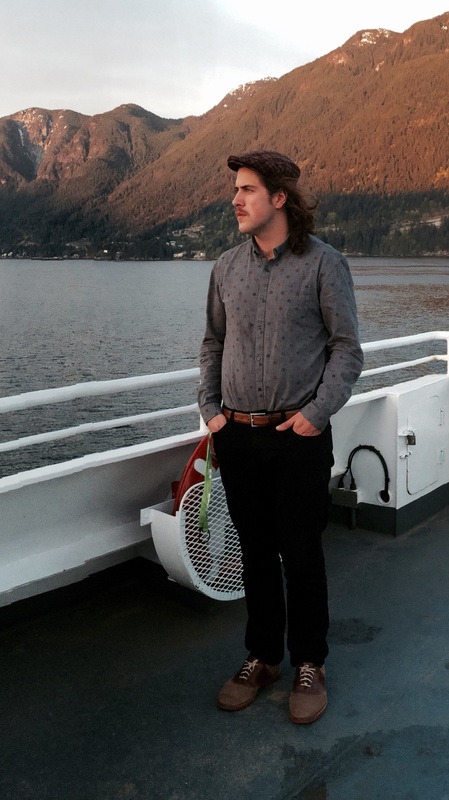 He left the coast and moved inland to Winnipeg to study Environmental Design. It was during this time that he began writing his own songs. After one year he headed further east to London, UK where he continued writing and playing music. He found himself working in the film and visual effects industry, which led him back to the beloved West Coast. He commuted to film school in Vancouver from Bowen Island everyday for two years, and used the island’s inspiration to continue making music. He is now nestled on Bowen Island again after just recently releasing an EP that shares the essence of the island and the grit of the big cities. Be sure to check back on Thursday April 14th for the teaser video of the Under The Mask video series. We'll be launching it later this month! It's a great feeling to be a part of an Oscar wining Visual Effects Studio. We'd just like to give a BIG congratulations to Double Negative for their work on Ex Machina. A special shout out to the Rotoscope, Prep and Matchmove departments. What a masterpiece! If we could go back in time and really look at where the spark first began for Michael Gresham & The Rotoscopers, we would probably begin sitting in a dark Visual Effects screening room in Vancouver at 8pm, with a couple guitars, Michael and Anna. It was late and they had both been working overtime everyday for weeks, but still wanted to play music badly, so after emailing back and forth, cancelling because of overtime and rescheduling, they finally decided to play some covers together and started to work on the song "Well She's My Love". Anna's ability to harmonize was so great, coming up with different vocal parts on the fly with ease. Anna is easy going and fun to be around but also very motivated. You will find her working late with her VFX Assets team, rehearsing and playing shows, recording, writing music, all while growing a baby inside her... Her abilities led her into White Hart Studio's to sing on all "Searching For The Pineapple Blues" songs. Even though the days were long and time was hard to find, Anna's experience and sweet voice fostered the seed that eventually grew to become the band. In the ever changing and magical world of Visual Effects, you must be sharp to act, respectful to others and have the ability to adapt to a new role faster than a camera at 60 frames per second. This also describes who Shane Meehan is. Leaving his "Shire" like home of Fort Saskatchewan, Shane chose the adventure of rain over and across the snowy Rocky Mountains, in Vancouver. His initiative to expand and adapt has quickly led him to become a Rotoscope Supervisor at Double Negative VFX. Having that openness to adapt, Shane wanted to take on the challenge of playing Bass guitar with The Rotoscopers. His repertoire of films and music is uncanny, so watch yourself when you chat with him and you think you know something about a film, he'll have you beat. Come say hello at the next show and keep your eye out for Shane, his stage presence is known to be a crowd pleaser! To start the new year we have a new song. Lukas is in studio at Rain City Records laying down some late night drum tracks. Lukas is one of the finest Rotoscopers here in Vancouver. He works at the Oscar winning studio Double Negative VFX (Interstellar, Inception). Film, graphic design and music are his bread and butter. Born in the mountains of Switzerland and raised in Italy , Lukas speaks 4 different languages and it's no wonder that art and design are a part of his life. If you get the chance to try his fondue and cooking, we very much recommend it. So, be sure to look out for his name on the big screen soon, and don't forget to see him play drums live at the Roxy, January 29th. You know it was a real treat to play at the Roxy last Friday! We couldn't believe the support we got and how much fun we had playing. Can't wait to play for you all again. It was a great night for a great cause on Friday. So happy to play some new tunes and enjoy the evening. See you next year at the Girls4Girls Charity event!